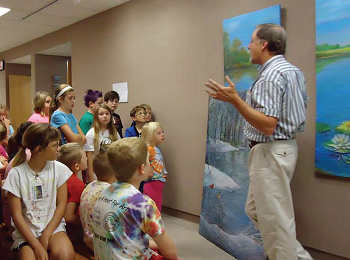 Children in mid-Missouri will have an opportunity to explore their creativity at the Kemper Kids Summer Art Camp at William Woods University. The camp allows youngsters to explore their artistic side through fun activities. Intended for children K-8th grade, the camp will be hosted in the Gladys Woods Kemper Center for the Arts. Three, five-day sessions will be offered from 10 a.m. to 3 p.m. The second session, "Magical Art: Adventures in Mixed Media", will be held July 29 - August 2. Campers will create art objects using non-traditional materials of their own creation, such as tissue paper medium, homemade clay, silicone, and much more. Youngsters can choose to attend one or all of these sessions. Registration form and payment may be dropped off at Kemper Arts Center between 8 a.m. and 6 p.m., Monday-Friday until June 15 (May 15 for a 10% early-bird discount). It also can be mailed to Nicole Petrescu, Mildred Cox Gallery, William Woods University, One University Ave., Fulton, MO 65251. $200 per session: Includes all arts and crafts materials, camp t-shirt, daily snacks and drinks. Additional sessions and second child in same family: $175/week. After the first session is purchased, any additional session will qualify for the discounted $175 rate. William Woods Employees will receive a special discounted price of $175 per child per weeklong session. Additional sessions and 2nd child in same family will be $150. 10% discount applies to payments received before May 15. Lunch is available, per request for $10.00 day. Requests must be made in writing 10 days before the beginning of the camp session. Before and after care may be provided, per request, for $5/hour, 8 - 10 a.m. and 3 - 5 p.m. Requests must be made in writing 10 days before the beginning of the camp session. For more information, visit www.williamwoods.edu/CoxArtGallery or contact Nicole Petrescu at Nicole.Petrescu@williamwoods.edu or 573-592-4244.